If you're in the hunt for a professional custom masonry services provider here in Wahiawa, then our expert masons can surely help you. As it is, we have some of the most skilled artisans in the state who have previously worked on numerous masonry projects before for both commercial and residential clients so you're guaranteed the best results possible. Brickwork. Bricks are some of the most versatile building materials that any mason can work on. Accordingly, our artisans can create practically dozens of permanent structures using these hardscaping materials: wall cladding, fire pits, fireplaces, steps, and many more. Natural Stone. Among the most common custom masonry material that we use include natural stones such as slate, sandstone, limestone, marble, granite, and more. Using these decorative stones, we can create stunning table- or kitchen tops, flooring, fireplaces, fire pits, Jacuzzi, decks, and more. The wide array of natural stones means that our expert masons will never have a hard time achieving your desired look and feel for your property. Stone Veneer. Our company can create sturdy, functional, and beautiful stone veneers for both exterior and interior parts of a residential property or a commercial establishment. The veneers we use are all top quality ones since we get them directly from trusted manufacturers and suppliers of landscaping materials. This means that we're not short-changing you just to complete our custom masonry project involving stone veneers. Retaining Walls. 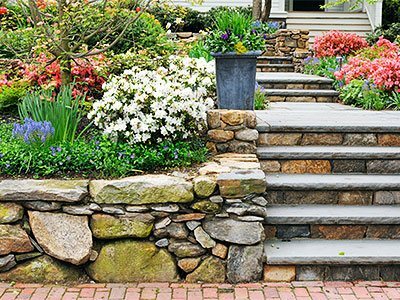 Who says retaining walls can't be stunning? We beg to disagree. As it is, our team of artisans can make retaining walls attractive, aside from being sturdy and well-built. Every custom masonry task that we accept is handled by experienced masons. Our people are skilled and efficient in creating stunning masonry pieces that you will surely love. Additionally, we only use premium materials in our masonry projects to guarantee safety and durability. Best of all, our customized works are unique and will reflect your sense of style and preferences. We achieve this by sitting down with you prior at the start of the project to know your design preferences. This way, our final output will surely be highly personalized. Just contact us today and let us work our magic and bring you the best results from the custom masonry work that we will provide you. Hire us and let us make your Hawaii property more functional and attractive with our professional masonry services.